Over the past week, those strolling through the 40th Street Allee may have noticedÂ a disturbance to certain sections of the pathway. Craig, Bryant Park Corporation’s Vice President of Capital Projects and animal rescue operative, penned an explanation to his department’s most recent upgrade to the park. 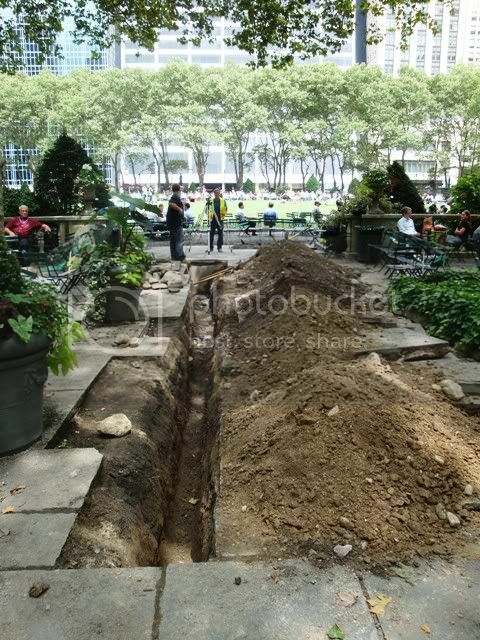 In order to better serve the patrons of our winter ice rink and holiday market, The Pond and The Holiday Shops at Bryant Park, the Bryant Park Corporation is constructing a sanitary sewer line in the south central area of the 40th Street side of the park. To support the crowds that visit the winter events, portable restrooms are brought in and require daily pumping and cleaning of the toilet tanks. The new sanitary line will enable the event producers to install a trailer with multiple bathrooms inside, connect to the sanitary line beneath the trailer facility, and use a gravity system to discharge effluent. No offensive, expensive daily maintenance is required, improving the overall quality of the holiday activities in the park. The sanitary line will tie into an existing manhole situated in the 40th Street Allee. The project involves the removal and replacement of extensive bluestone pavers, trenching and installation of a six inch diameter pipe, and reinstallation of the bluestones. The project is scheduled for completion by early August 2009. We appreciate your patience while the sanitary line is being installed. Feel free to contact us if you’re curious about any construction or maintenance activity you observe in the park.